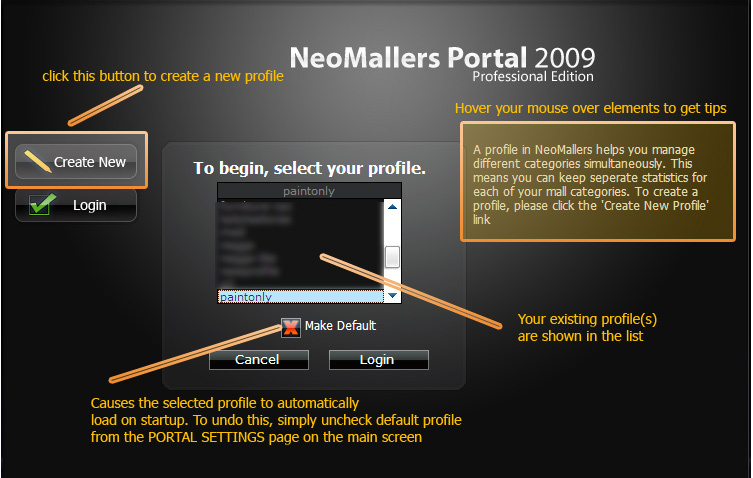 A profile is a database that holds data for a specific category. For example, you can have multiple profiles for each mall spot that you do. In other words, if you switch from Battledome weapons to Petoets, you don't have to throw away your battledome stats. Simply Cceate a new Profile. 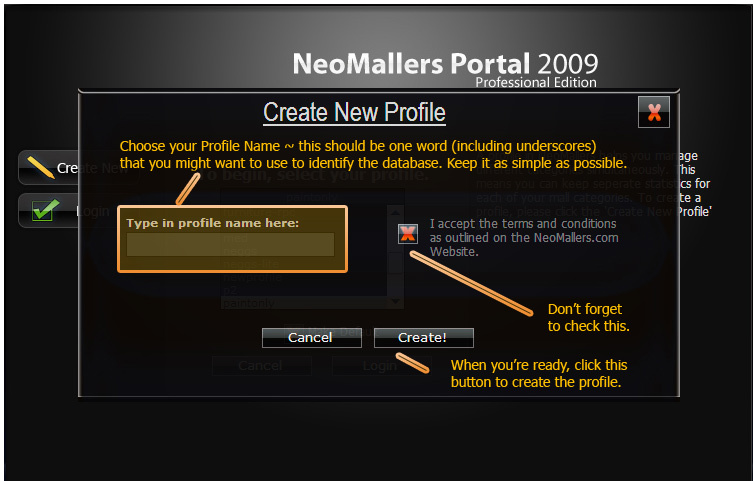 Choose your Profile Name ~ this should be one word (including underscores) that you might want to use to identify the database. Keep it as simple as possible. For example, if you're selling books, simply putting "Books" is a good idea. Click Create- Click "Create" to finish the process. 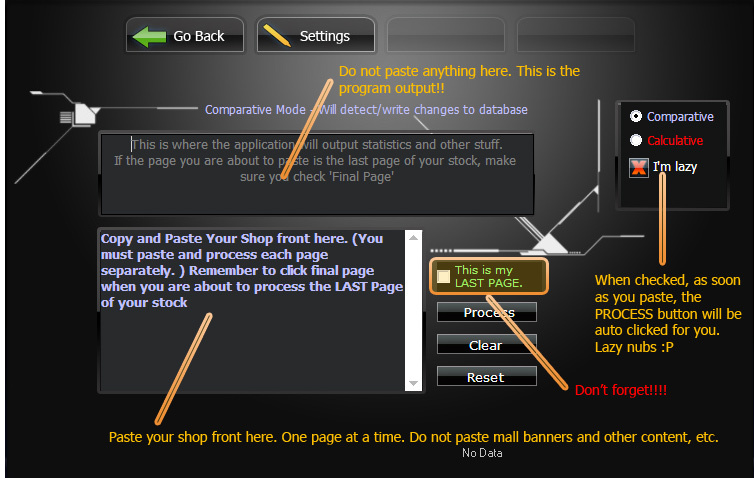 Note: You must STILL enter your shop wizard prices as they are not retrieved during the shop front copy-paste process. Please do NOT suggest an automated means to get the Wiz Price from Neopets. This is strictly against the rules. Also, the online database portion is discontinued, thus you will not be able to access it. Make sure you also check Comparative. By doing this, you tell the program to scan the database and make changes to it. When pasting, follow these steps. Step 2: Copy page 2 of your stock. Click Process. Repeat for all your pages EXCEPT when pasting the last page, check "final page" before clicking process. Word of Caution: Do not include text such as “next 80 items” You must ONLY copy the item information (NPS, Stock, price) Please refer here for more details. 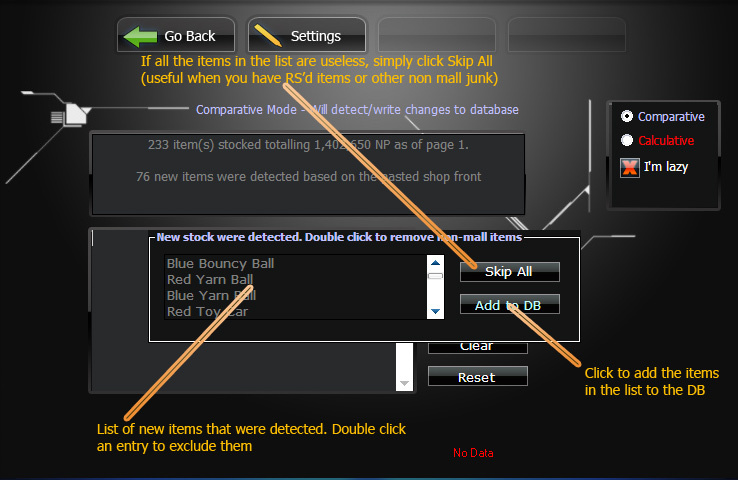 When new items are found, another message (after the final page) will popup asking you to confirm. Exclude the items that you do not wish to include (such as restocks or any other item that is not related to malling) by double clicking the name inthe list. When you are done, click Add to DB and the application will create and update your database according to the specifications you gave it during the copy+paste process. You are now ready to enter the shop wizard prices. Alternate Method: You can also create this from the sales history. However, your shop front is recommended since in most cases, it contains a larger amount of your stock that are recordable.